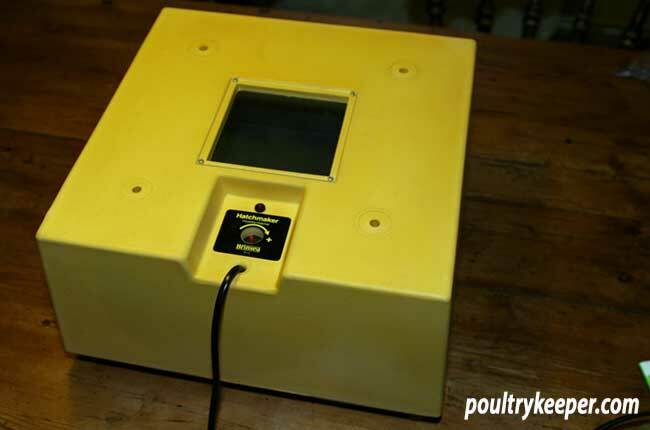 The Brinsea Hatchmaker is a still air incubator that can take around 40 eggs but is also a popular choice with poultry breeders to be used as a separate hatcher for hatching eggs. 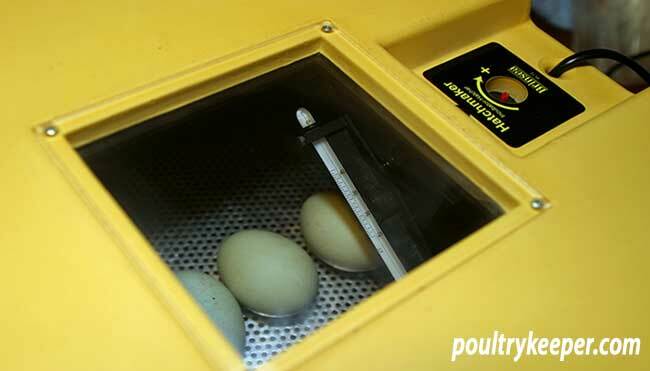 When used as a hatcher, it is possible to keep one incubator running continuously, adding eggs in small batches as they are laid. A few days before the hatch, transfer them into the hatcher which is maintained at the high humidity required for the hatch, keeping your main incubator clean and topped up with more eggs. Once eggs have hatched, it can be cleaned and sterilised using an incubation disinfectant solution and re-heated ready for the next batch of hatching eggs. This incubator is well built using a sturdy plastic mould for the base and the same for the lid. 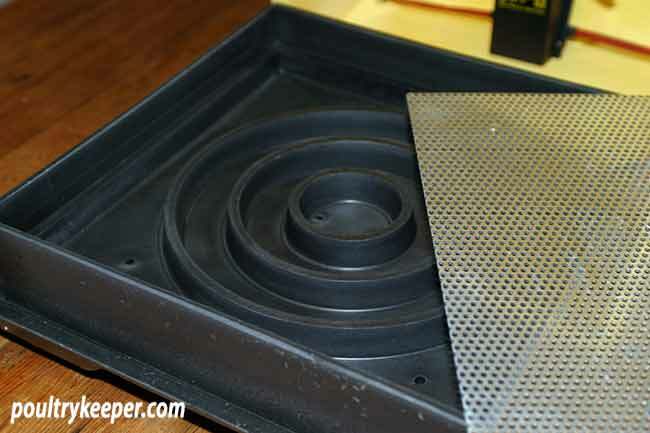 There is a perforated aluminium tray that drops into the base of the unit and eggs are placed onto this tray. 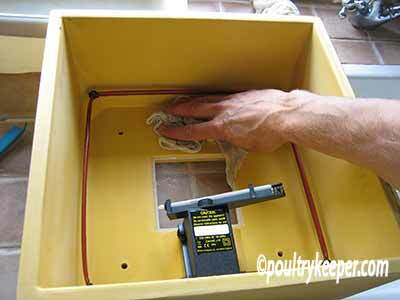 The heater element is a heater wire that is strung around the inside of the lid. The thermometer is mounted into a swivel clip so that the height of it can be adjusted to suit a wide range of egg sizes. Temperature control is provided by Brinsea incubator’s ‘proportional electronic system’ and the control is very accurate, unaffected by voltage variations on the mains. 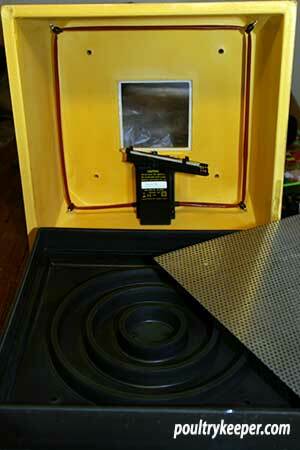 There is a 12 Volt version of the Hatchmaker available too which would certainly be useful for remote locations. The Brinsea Hatchmaker holds around 40 eggs although I have had 42 fairly large eggs in there which is more than most of the other similar units available at this price. Humidity is created inside the Polyhatch by adding water to the troughs inside the base. Water is added by removing the aluminium plate and pouring it into the base. It is difficult to know exactly how much water is left inside the trough but you soon get to learn how many days the water will last at the set humidity level before it needs a top up. Unfortunately, all of the eggs need to come out to top it up unless you pour the water through the perforated aluminium plate. If you are candling regularly to monitor progress, removing the eggs is less of a problem anyway and without automatic tuning, you need to turn your hatching eggs at least 3 times daily anyway. As a hatcher, this isn’t a problem since the water lasts long enough for the hatch to take place. After you have hatched a few batches of hatching eggs, you will soon find it a chore cleaning and sterilising your incubator afterwards. Many forced air incubators on the market have a guard around the fan that stops your chicks from touching the fan blades but this also unfortunately stops you from getting a cloth in and around the fan for cleaning. Some incubators put the fan up high on the lid of the incubator however you will find that during a hatch, as chicks dry out in the incubator afterwards there is a large amount of fluff from the chicks that gets literally everywhere. The Brinsea Hatchmaker can be used as an incubator, however the lack of automatic turning makes it more suitable for use as a hatcher. The Brinsea Polyhatch is a similar incubator that also comes with an automatic turner so if you are thinking of using the hatchmaker as an incubator more than a hatcher, the Polyhatch should also be considered. When used as hatcher, the Brinsea Hatchmaker really works well since incubators tend to get very messy, very quickly and forced air incubators get lots of fluff and mess around the fan making sterilising difficult. If used as a still air incubator, the Brinsea Hatchmaker has a great capacity for reasonably large hatches and providing you are happy with turning your own eggs, it is a very economical way to hatch a good number of eggs. For me, the Hatchmaker, has been tried and tested over and over mainly as a hatcher but also at ‘peak’ times of the year, as an incubator and has been extremely reliable and it has very little to go wrong with it. Update June 2015. Brinsea do not make the Hatchmaker any more, although their website does offer a spare temperature control PCB.